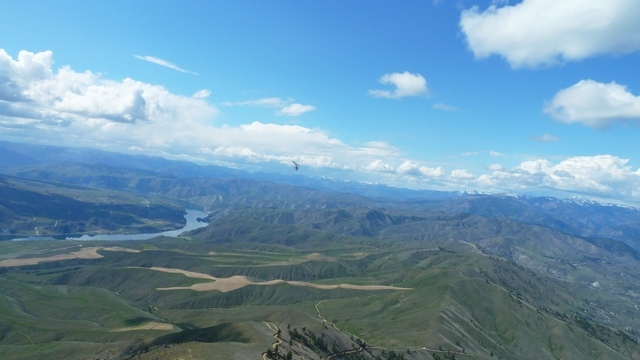 It’s now early June, the flying season is here and the Chelan dust devils are taunting us to come out and play! Due to the dryer than normal winter and hotter than normal spring, I predict the X/C conditions for the meet, June 28 to July 3 are going to be epic. We’ve received so far 12 preregistered pilots which include 5 paraglider pilots from Nepal – maybe after they launch at the Butte they will choose to fly west into the mountains rather than east onto the flats. Preregistration will save you $10 ($110 now vs. $120 later) and it runs through June 15th…Ah heck, let’s keep it open a bit longer – OK, June 21 is the new cutoff for preregistered pilots. Information sources for the 2015 Classic/US Open Distance Championships are popping up all over on the interwebs. You can always find stuff on the CBCC website. We now also have a dedicated Chelan X/C website, “chelanclassic.com”, courtesy of Jim Steel. We are planning on using the new site for daily scores postings. Davis Straub has posted meet info on the OZ Report. We currently have two active Facebook locations, search for one at: “2015 Chelan Cross Country Classic & Open Distance Championships”, also check out “Chelan XC Classic Pilots and Drivers” if you would like to find ride and retrieval coordination information. How about Twitter??? Here are some additional planned side events for this year’s meets: 1) Cross Country Skills Workshop – the weekend before the meet, Sat./Sun. June 20, 21 and Sat., June 27. Paul Dees and Owen Shoemaker are facilitating this informal orientation and flying. This is a great opportunity to learn your new or dust off your old X/C skills – come be a student or a mentor. Meet at the Chelan Falls Soccer Field at 9:00 am – and the price…Free! It should be a lot of fun. 2) Sat. June 27, 5:00 pm registration at the Chelan Falls pavilion (LZ) then 7:00 orientation and tips for the meet provided by the Meet Director (me). 3) Battle Above the Butte – The Rematch – informal grudge match between the paragliders and hang gliders with beer money and bragging rights on the line! 4) An X/C Information Exchange evening, beginning at 6:00 pm, Monday June 29th at the Chelan Airport pilot lounge. Experienced, wise pilots can volunteer and prepare a 10-minute talk about tips and tricks of X/C flying. They’ll also bring along paper summaries for handouts. Pizzas provided but please BYOB 5) USHPA film festival is planned for Wednesday, July 1 time and location TBD 6) We’ll have daily raffle prizes which can be measured in tonnage this year. 7) The always popular BBQ and the awards ceremony on the last day of the meet, Friday July 3. Camping at the Beebe Bridge Park (first come first served) or Chelan City Park (check for reservations). Hey everybody make your plan and come fly Chelan! Cross Country Information Exchange → ← Frostbite at Area 151 this year!